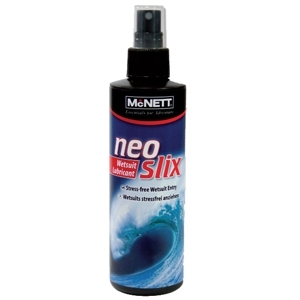 NEOSLIXTM WETSUIT LUBRICANT HELPS ENSURE A FAST AND STRESS FREE ENTRY OR EXIT FROM NEOPRENE WET OR DRY SUITS. Specially designed for use by Scuba divers, Surfers and Triathletes where NeoSlix has been proven to reduce transition time by up to 60%. NeoSlix also helps prevent uncomfortable skin rashes caused by wetsuit abrasion areas. Used on a regular basis, will help retain the suit's appearance and prolong its life, by reducing stress to critical failure point such as seals, zips and pull-cords etc. Suitable for use on latex seals, neoprene, silicone and rubber. Hypoallergenic, fragrence free and environmentally safe.